Diatomaceous earth is now being widely used as an effective, natural agent to worm pets without the use of toxic chemicals. Many pet owners are horrified to learn their pet has intestinal parasites, or worms. Pets can pick up these parasites from other cats and dogs, insects or the soil in their environment. No matter how parasite-free their mother is, puppies and kittens are even born with worms. Diatomaceous earth (DE) is the microscopic remains of phytoplankton, known as diatoms. These one-celled organisms lived in the oceans and lakes of the world thousands of years ago and are mined today for many uses, from cosmetics to pool chemicals. DE particles have tiny, razor-sharp edges which produce invisible cuts on the exoskeleton of insects and parasites when they come into contact with them. It eventually causes dehydration and death. Kept dry, DE has an unlimited shelf life. 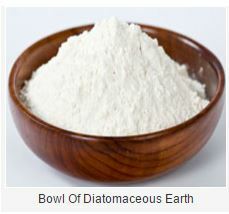 Diatomaceous earth is available in a distinct powder formulation for use internally in humans and animals. Food-grade DE is safe for consumption by pets to aid in worming. Never feed DE in any other form to livestock or humans. Food-grade DE is available at most feed stores and through onlineretailers. Industrial-grade DE for swimming pool filtration and other uses is also available. However, this formula is toxic and can be fatal if consumed. Be very careful to read the package thoroughly to determine its contents. Puppies and dogs weighing less than 10 pounds: .5 to 1 teaspoon. DE can be mixed with your pet's food as a daily preventive to many types of intestinal parasites. Most dogs and cats do not react negatively to the taste or texture of the powder being added to their meals. You should take care to keep yourself and your pets from inhaling DE, as it will cause irritation to the lungs due to its dehydrating effect. Similarly, avoid getting DE on your hands because it can cause severe dryness. Many internal and external parasites can be controlled and eliminated with DE. Intestinal roundworms, hookworms and tapeworms are a few of the parasitic infestations which DE can eliminate. Externally, fleas and ticks can be controlled by lightly dusting the pet's body with diatomaceous earth. DE is also used in the garden to kill ants, slugs, snails and aphids, among others. A very important benefit with using DE to control insects and parasites is that they have no means to build a resistance to the substance. Prebiotics & Probiotics - There is often a lot of confusion as to the difference between a Prebiotic and Probiotic and what each of them do. Dog Eats Poop - although this may be a natural behaviour to our dogs, being slobbered over with a breath smelling of poop is not something that most owner appreciate - learn why this happens and how to change the behaviour. Food as Medicine - It is well known that most of the “age’ or degeneration related diseases are closely related to the mismatch between dietary and lifestyle habits and the genetic predisposition in people. The same goes for animals.